Intense, 10-week training plan specifically designed to train athletes for the GORUCK Selection event. This is a 6 day/week training plan which includes multiple 2-a-days, as well as long weekend rucks (up to 20 miles). The plan demands a significant time commitment to complete. The plan includes a 2-week taper, and is designed to be completed the 10 weeks directly prior to your event start date. Most weeks you’ll train Monday through Saturday and take Sundays off. 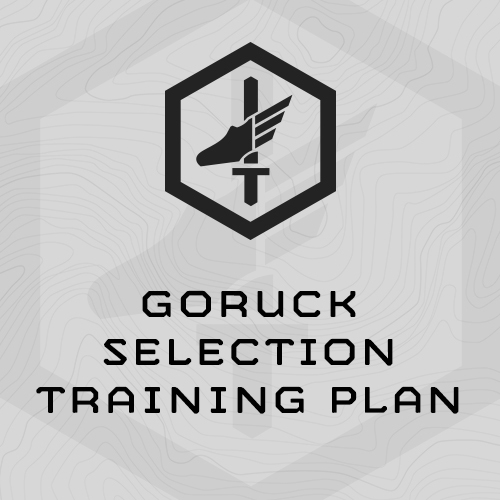 This is our 3rd Version of the GORUCK Selection plan, and includes specific training progression for the initial GoRuck Selection PFT (push ups, situps, 5 mile run, 12-mile Ruck @ 45#). - GPS-enabled Stop Watch with repeating countdown timer (Garmin Forerunner 10 is recommended ) A GPS enabled watch will make measuring run and ruck distances much easier. - ALICE Pack or same ruck you will use at selection, 40-60# of filler. Ruck 3-Mile at Interval Pace based on SESSION 1 -PM finish time. 150x Step-ups @ 40# at Interval based on SESSION 2 step up time. Ruck 2 miles at Interval Pace based on SESSION 4 time. Rest 5 min. between intervals. Thought I would give you an update on the Selection program. I did not finish Selection, but felt as though I was definitely one of the more prepared (physically) individuals there. At 46 years old, I withdrew as the #10 athlete at hour 20. Within 30 minutes of my withdrawal, there were only 5 athletes remaining. Selection is the real deal. Very, very challenging. Your program did an excellent job of preparing me physically. I was one of the top athletes in the pushups (100) and sit-ups. (90). My 5 mile run was in the top 10 and my 12 mile ruck was also top 10. I followed your program to the letter and it helped me to progress from 55 sit-ups to 90 and keep my pushups strong throughout training. If I could make any suggestion as to how I could have been more prepared would be to get some advice on training to compete with zero nutrition. We received absolutely nothing and no electrolytes. I did train with significantly reduced calories, but I was not prepared for the degree at which they restricted us.